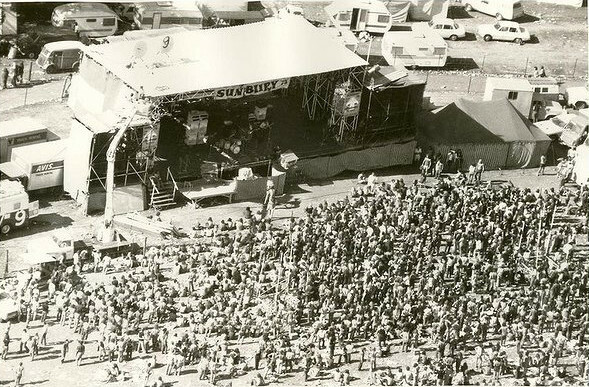 The Sunbury Pop Festivals were intended to be Australia’s Woodstock. Four of them were held, in late January of each year from 1972 to 1975. The 1973 festival is one of the best remembered, largely due to the first release from Mushroom Records, “Sunbury 1973 – The Great Australian Rock Festival”, a three album set of the festival’s highlights. About 25,000 people attended the 1973 festival, and performers who played there included The Captain Matchbox Whoopee Band, Billy Thorpe & the Aztecs, Spectrum, Max Merritt & the Meteors and Johnny O’Keefe (who was initially booed off the stage, but won over the crowd to such an extent that he ended up doing several encores). The MC for the festival was the comedian Paul Hogan. Tagged 1973, Chris Wilson, Jan 28, Sunbury '73, Sunbury 97, Sunbury Pop Festival, The Fauves.